Aadhar is a 12 digit unique identification number (UID) issued by government of India. Aadhar card is important document and it can be used as identity and address proof. Linking Aadhar card to Bank account offers various benefits including LPG subsidy. 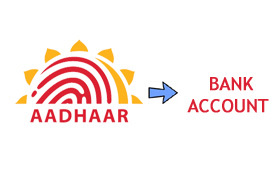 In this post I will be explaining process of linking Aadhar Card to bank account. Process explained by me will be general process and it will be applicable to all banks like State Bank of India, Axis bank or any other. To link your aadhar card to bank account online, internet banking account is must. Follow process given below to link your aadhar card with bank account online. First you need Login to Internet Banking account. After logging find out link “Aadhar card details” or “Aadhar card status”. Click on link and update your Aadhar card information in respective fields. Press submit button and your application will be saved. Bank will verify information submitted by you. Once your application is processed you will be notified via SMS or email. If you don’t have internet banking facility you need to follow procedure to link aadhar card offline. Follow process given below to link your aadhar card with bank account offline. Download Bank account Aadhar linking application form from here. Take print out of this form and fill your details in form. Enter your bank account number, IFSC code address etc. Enter 12 digit Aadhar card in this form. Take Xerox copy of your aadhar card and submit the form along with Xerox copy to bank official. Bank official may ask for original aadhar card for verification. Once bank verifies details given by you they will update their database. The most important benefit of linking aadhar card to your bank account is to avail social welfare benefits passed on by government to individual. Details of these benefits are given below. First scheme is DBTL- LPG Subsidy, under this scheme consumer can avail LPG cylinder at subsidized rate. Subsidy amount will be credited to Aadhar Linked bank account of consumer. To avail this benefit you need to register yourself with LPG cylinder distributor. Subsidies items like kerosene, sugar, rice, pulses offered by government is also linked with aadhar link account. Scholarships offers to students by government is also linked with aadhar enable account. In order to avail this facility student should have bank account linked with aadhar card. MNREGA – Pay associated with MNREGA Job card will be directly credited to aadhar link account. Apart from above benefits to consumer government will also get benefited as they are aware that money released for subsidy and other welfare is reaching to correct beneficiary and not to fake persons. I hope this post is helpful, as it covers almost every aspects of linking aadhar card with bank account. If you enjoy reading this article do share it with your friends on social media. Thanks Man! You are doing a great job.